It’s been a momentous week at Portfolio, as Portfolio has been in the news! Three of our students from last year (two returning and one who moved to San Francisco) were invited to present at Stanford University’s Fablearn conference. Congratulations to Lucas, Tiana, and Everett! The application process was incredibly competitive and we are very proud of our young makers and creators, already speaking at a national conference at ages 7 and 9. We (Nancy and Shira) will also be presenting. Portfolio was featured in Fast Company Magazine. We welcomed New York University graduate students in the department of music to our school, in preparation for a collaboration with them for our next unit which, stemming from student interest, will have something to do with music - broadly understood and to be co-designed with musicians and with our students. We’ve had a lot of fun this week, while delving into some very powerful ideas. 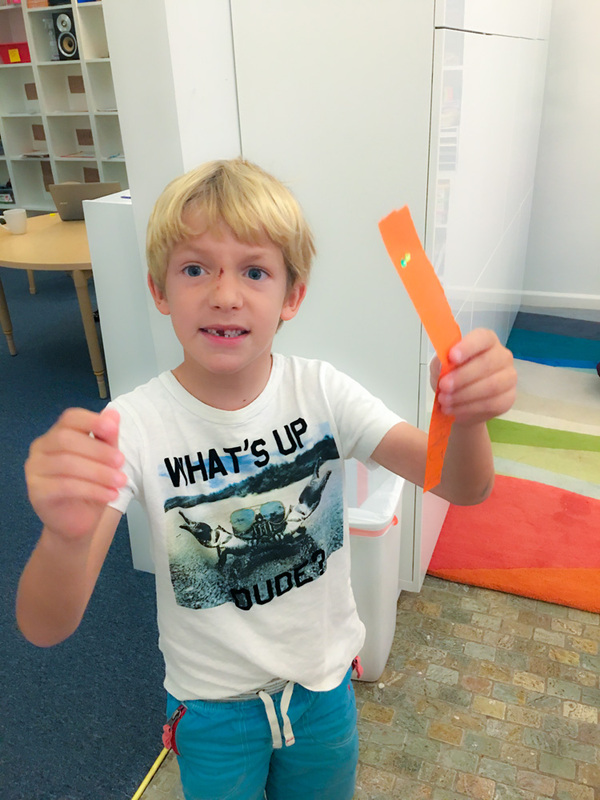 We opened our current unit of study - Becoming Martian - with rocket design, which is helping us understand what it will take to embark on a journey to Mars, while learning quite a bit of Newtonian Physics. We have also been developing our skills as imaginative and articulate storytellers, as we prepare to create a film exploring what it might be like to build a society on Mars. And, we’ve begun work with our current artist-in-residence, our very own co-founder and COO Doug Schachtel (who has a background as a filmmaker) to learn techniques and approaches of creative filmmakers. Throughout it all, we’ve been bonding as friends, with activities to get to know each other and to practice acting with kindness and teamwork, consistently reinforcing expected behavior as we all get acclimated to our new school. Working in flexible teams, our students spent much of the week with either the Martians (mostly students 7-10, with some 6 year olds) or the Plutos (mostly our 5 and 6 year old students). Students voted on their team names which do reflect how “space crazy” we are feeling. We introduced the theme of the possibility of a permanent human settlement on Mars, in our students’ lifetime. Our Martians watched the documentary Colonizing Mars: What You Need to Build A Mars Colony, over the course of two days, stopping each time we came to a person involved in bringing humans to Mars. We wrote these individuals’ names on our wall, with a brief description of who they are. We discussed how we might research more about these people and their work, and then reach out and to them to see if they might agree to be interviewed by us for our film. Our Plutos watched Welcome to Mars - Video for kids space camp with Andrew Rader, and learned that Andrew Rader is actually training to settle on Mars with the group Mars One. Both Martians and Plutos participated in the Balloon Rocket Challenge, building rockets out of plastic bottles, powered by balloons. Our rocket design engaged us in learning the basics of movement, propulsion, and friction. Our Plutos finished their rockets, while our Martians engaged in an additional challenge examining how propulsion and friction serve as constraints on their balloon rockets’ movement, and figuring out how to make their rockets both stop at a particular spot and move along a track. Meanwhile, our Plutos also explored friction as well as measurement, building ramps with different levels of resistance and measuring how far cars could move along those ramps. Our Martian’s formalized their learning with two simulations, using PhET from the University of Colorado Boulder, experimenting with and creating their own hypothetical scenarios utilizing friction and propulsion. They constructed tracks for a skateboarder and shot a cannon from different angles and at different speeds. They discussed how friction is used in the design of rockets and imagined what the world would be like without friction. 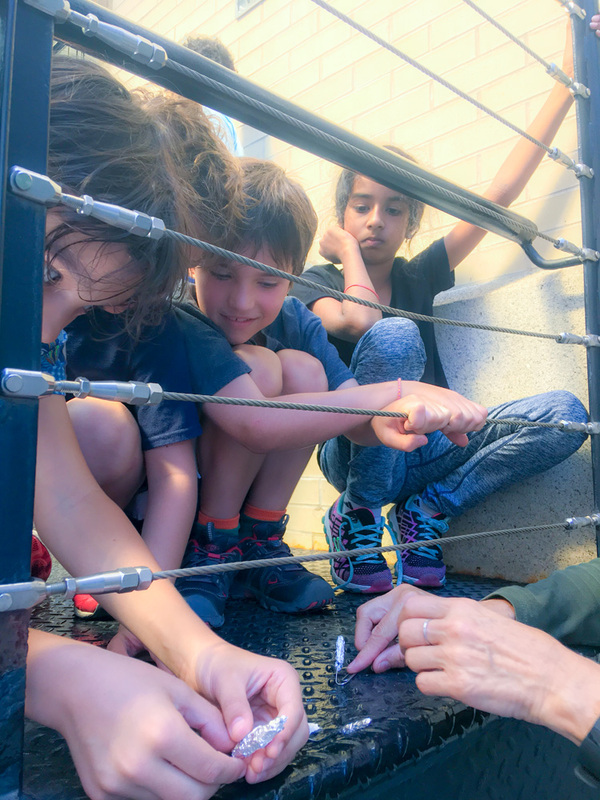 While continuing to explore the concepts of propulsion and friction, we introduced learning about gravity, with the Martians beginning prototyping and constructing our next rocket, powered by matches, and of course launched with close teacher supervision. We learned how to follow instructions from different sources, and how to use a xacto knife. Without even knowing it, some of our Plutos have planted the seeds for their own exploration of gravity. Building our unit as much as possible around student interest, we have a team of Plutos who have decided they want to build their own Mars gumball machine out of cardboard. We watched a do-it-yourself video on how to build a cardboard gumball machine, which one of our students, Orion shared. Thank you, Orion! We began thinking about the wide range of skills we will need to practice in order to build our gumball machine, and drew some early models. Students don’t yet know that through the process we can explore how gravity works not only for the planets, but even for the design of fun, whimsical things we want, like a gumball machine, right here on earth. Other ideas from some of our Plutos for personal projects include building a Mars settlement out of cardboard, sewing costumes for our film, and writing an Encyclopedia of Portfolio friendship including photos and interviews with everybody at Portfolio. We are preparing to make all those student chosen projects happen. We’ve been developing our understanding of characters in both nonfiction and fiction, and practicing interviewing skills. Martians and Plutos alike have been creating their own original characters. The Martians have each begun to develop their own science fiction story, while the Plutos are each developing one character to soon include in a story. We’ve worked on making our characters relatable, learning that it is important for those reading or hearing our stories to have empathy for our characters and be invested in what happens to them. We have considered ways that not only people but also animals and imaginary objects can be characters in stories, and how characters can either be fictional or real people we talk or write about. In preparation for interviewing people involved in bringing humans to live on Mars, we have been practicing interviewing techniques with one another, as we learn more about each other. We have also been developing questions we’d like to ask individuals we are hoping to interview. We’ve begun our work as filmmakers and physicists, and filmed videos using the application “Playground Physics” to measure the trajectory of objects, and more accurately calculate the speed of objects. We reviewed our videos, discovered several problems with our filming techniques, and practiced ways we can improve our filming movement in order to more effectively capture and analyze the trajectories of moving objects. We will continue using this application to film our rockets in order to better understand and control their movement. We also worked with Doug on a technical introduction to the Samsung Galaxies we will be using to video, and began practicing shooting video. Building on measurement of trajectory and distance, our Plutos played with measurement. We measured using long sticks, lines of wooden blocks, and then designed our very own rulers. After a read aloud about Super Worm, we decided to measure how long Super Worm must be to save his friends. We’ve been enjoying our daily hour of outside fun in the park. In addition to free time to play, we’ve been practicing hand eye coordination drills, agility and teamwork games. We have also started to work on basic forehand technique for tennis. Our Plutos are also enjoying our newly instituted daily mindfulness and yoga, helping us transition back to learning and creating after our active outside play time. And, we all dove into music and movement in the first of our weekly music classes. Our Martians began documenting their own work using SeeSaw, a digital portfolio program they will use for work in progress, and from which they will select the work they want featured in their professional digital Portfolios on our web page. We have completed most of our math and reading assessments, and look forward to diving into reading and math next week. This week we started our after school program in partnership with the School of Wonder. School of Wonder is creating an adventure-based curriculum of creativity and social emotional learning where each day is an adventure designed with a different artist. After a proper healthy snack, kids unveil the adventure of the day and take the lead as a group. Once finished, kids reflect playfully about the common journey by mapping the experience in one of the islands of the 3D treasure map. It’s hard to believe that we have only been at school for a week and a half! We are so excited to continue our journey of learning and creating together!